The universe talks to us all. We just have to learn to listen. For example I had bought some of the new Hershey chocolate spread to try out. It was Wednesday. Thursday I come home from work to find a surprise left for me on my kitchen counter, marshmallow Peeps. My dad had got them for me after Easter and just decided that Thursday afternoon it was time to give them to me. So almost an hour later that same day I open up the sales paper from our local grocery store. Graham crackers were buy one get one free. Yes universe I hear you loud and clear…you want me to have smores. So later that evening I was enjoying a couple of indoor S’mores. To top it off I was enjoying my snack while wearing my ‘Chillin with my Peeps’ t-shirt. Happy, I was so very happy. It seems toasting little yellow marshmallow bunnies puts a little lightness in my dark soul. Turn oven on to the broil setting. 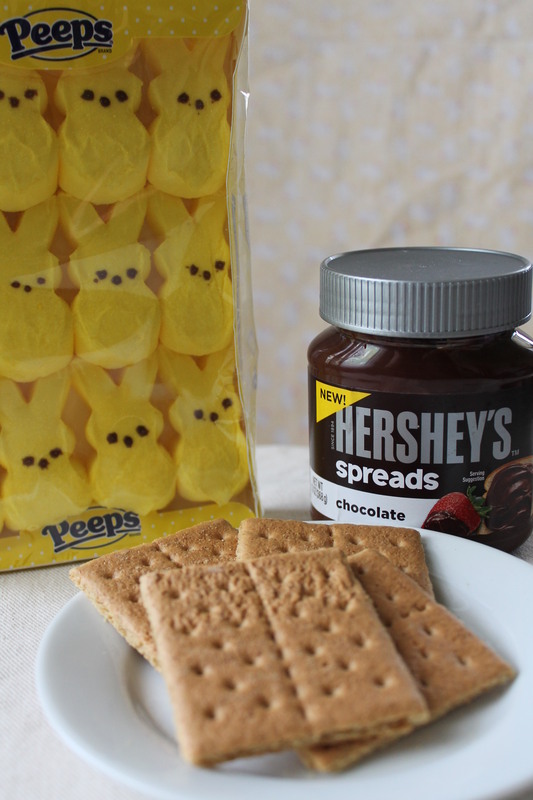 Take one of your graham crackers spread on the Hershey’s heavenly spread. Set aside. 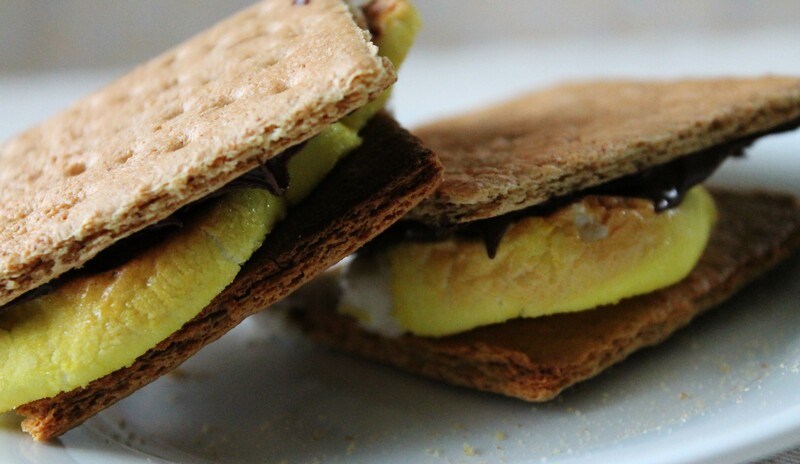 Put marshmallow on other graham cracker, place on cookie sheet. Pop that marshmallow in the oven. Watch closely. When the marshmallow is brown to your preference remove from oven. 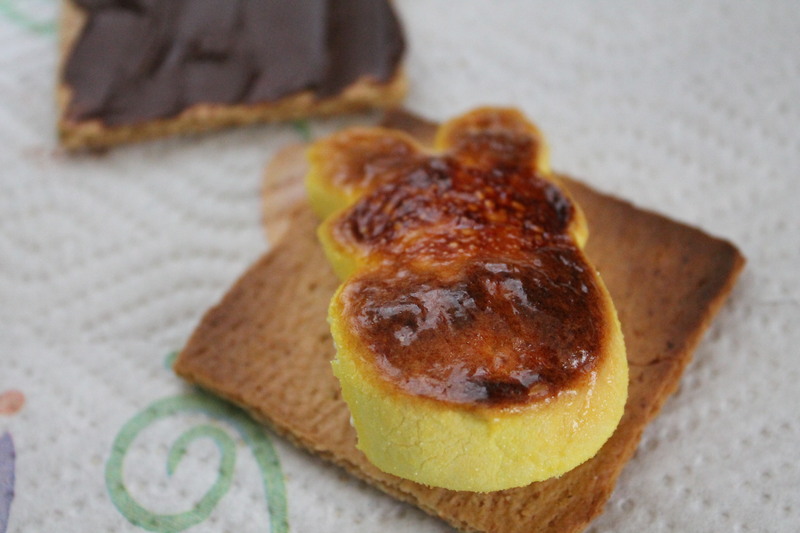 Now marry the toasted bunny up to the chocolate covered graham cracker. Now you have a sandwich of gooey marshmallow chocolate happiness. Also known as S’mores. After doing all that there are two things left to do: sit back and enjoy. It is apparently cake baking week here at the crypt. I’ve been baking cupcakes or cakes everyday this week. Family gatherings, birthdays and tomorrow, Easter dinner. A year ago I hosted a baby shower for my daughter who was expecting her first child. We had peep smores at the shower. 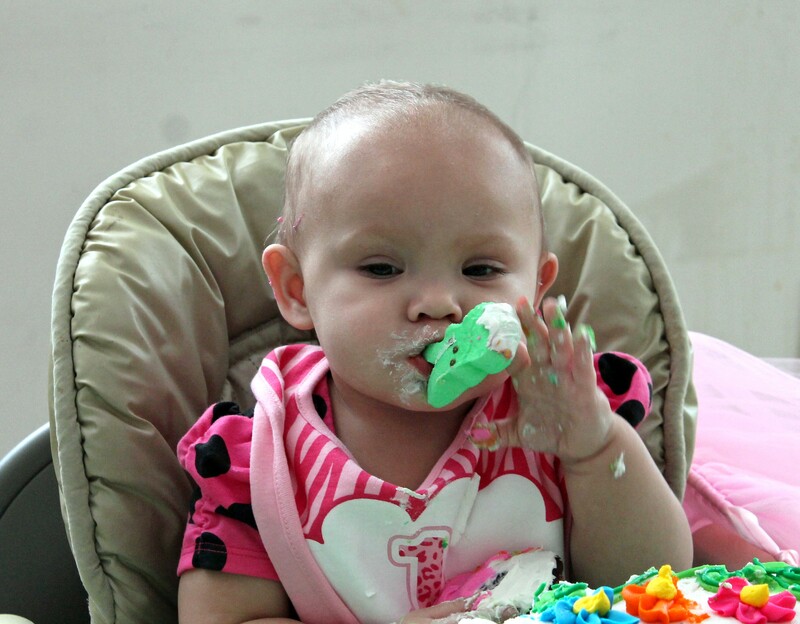 So for Ms. Kaylei’s first birthday I suggested we peep out the cupcakes. My daughter agreed, which was a good thing since I had just bought a ton of peeps to try out the peep cake I saw on Pinterest. I had a lot of peeps. It was a peep invasion here at the crypt. So today I’m going to kill two peeps with one post. The peep cake pin caught my attention for the simple fact. I LOVE PEEPS! I have never met a peep I didn’t love. This cake actually had peeps mixed in with the batter. Holy Peeps in a cake, Batman! I was excited to try to make this cake. I followed the pin to the website that had the full instructions. The instructions used a spring form pan. I don’t have one so I used two round cake pans. FYI: if you have the spring form pan, use it. Before we go any further I must tell you. This cake was delicious. Mine did not turn out as pretty as the picture on the pin but I was able to live with that. I’m sure using the spring form pan would have changed the outcome of my cake. Guess maybe I need to invest in one. To see the instructions I followed please visit the original site for Peepza Rustica. Here is my journey I took along with my peeps. About 2 dozen peeps. A variety of colors. Heat oven to your cake recipe/box instructions. Prepare your pan. Mix your batter. Again follow the recipe/box instructions. Now get your peeps chop those little guys up, show no mercy. 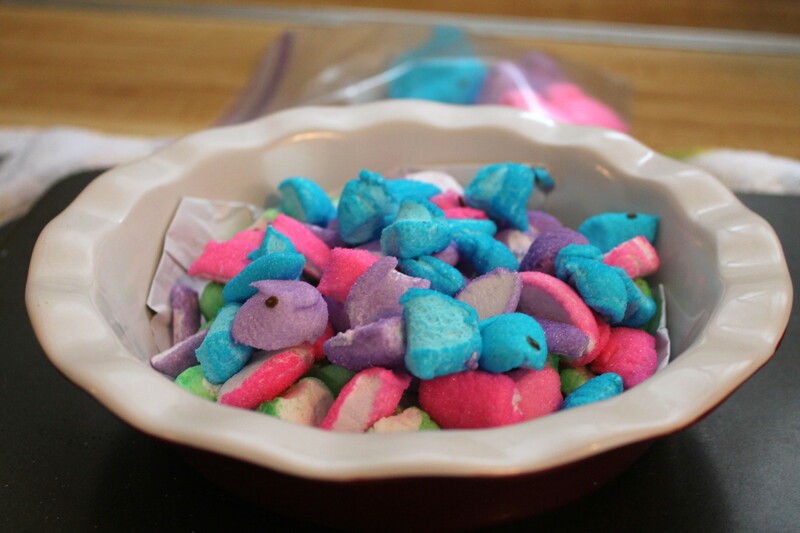 The original recipe has you chopping the peeps into tiny pieces. Mine were bigger, mainly because those things are sticky. The more you chop the more marshmallow insides are exposed and the more stickier things get. I was not a happy peep slayer when things got sticky. If using a spring form pan: Once the peeps are chopped. Pour enough batter into your prepared pan to just cover bottom. Cover batter with your half your peep parts. 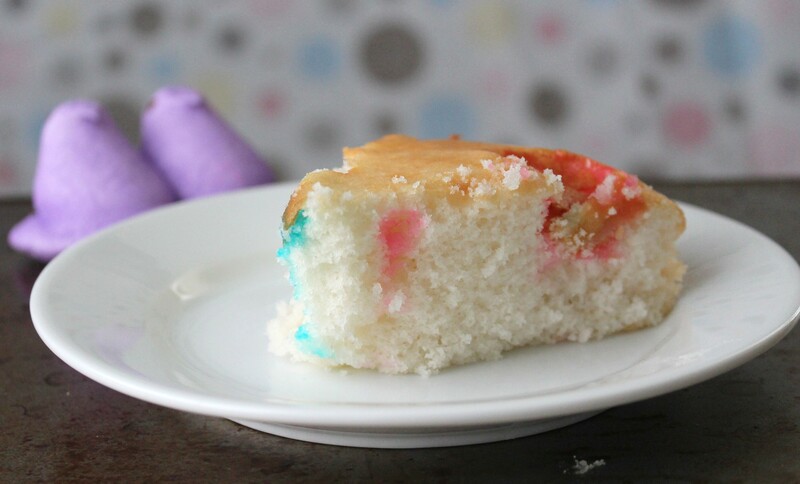 Layer in more batter. Layer in rest of peeps, cover with rest of batter. If using two round pans: Once peeps are butchered. Cover bottom of each prepared pan with a thin layer of batter. 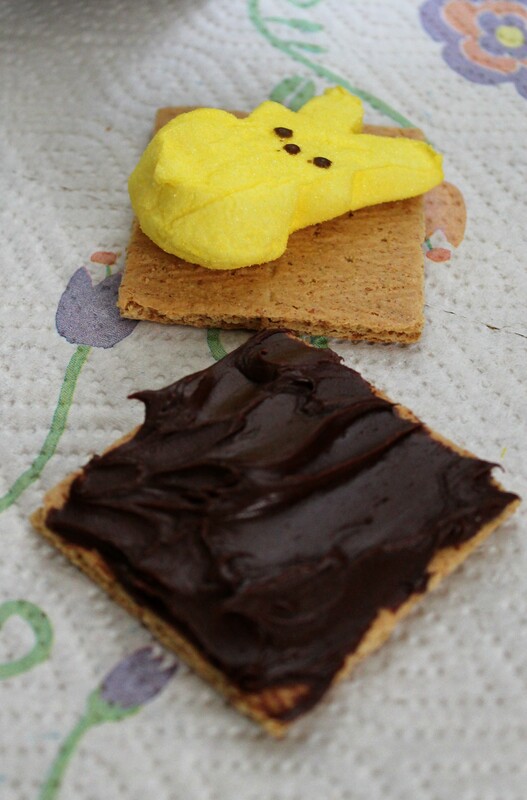 Split your peep parts into half. Layer one half in one pan the rest in the other. Cover each peep layer with rest of batter. Bake according to recipe/box instructions or until an inserted a toothpick or fork comes out clean. I cooled my two little cakes. Once cooled I turned them out. Before I could layer them atop one another the top layer fell apart. What the peep? The cake is just so fragile when you divide it in between two pans. I then understood why the spring form pan was used. So forgive my pictures of the little slices I was able to save. So you see it wasn’t a pretty sight. Oh my, it tasted so good. So incredibly good. The cake did not even need frosting. I don’t think I will make this cake again. Mainly for the fact chopping those peeps up is pretty sticky business. I just can’t convey how sticky of a mess it was. Bake your cupcakes. I made chocolate. Now pop a peep on top of each cupcake. The chick peeps you just have to place on top of cupcake and push down slightly. 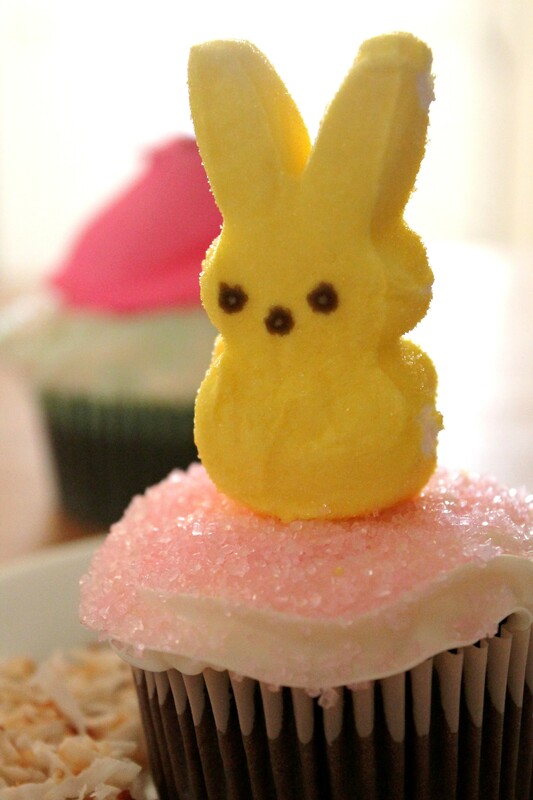 The bunny peeps, you need to make an indention in the icing in center of cupcake and hope the bunny stays upright when you place it on the cupcake. 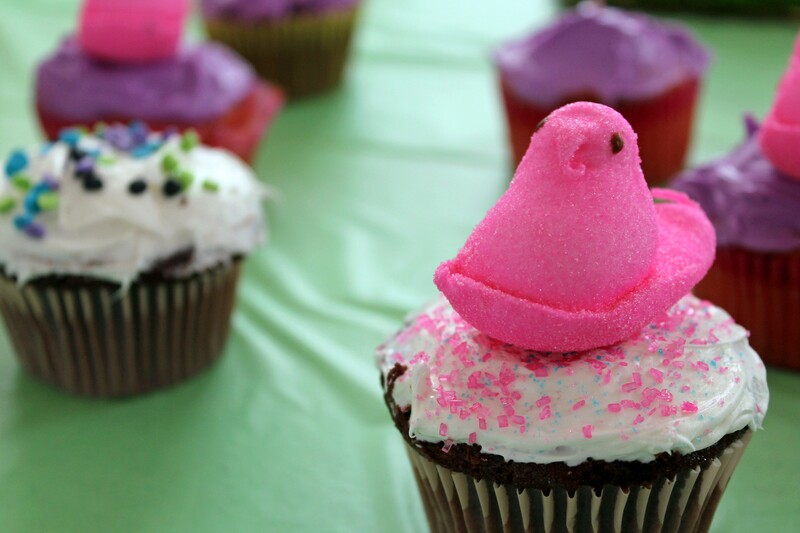 Ain’t no party like a Peep party! Party time with my peeps! Kaylei grabbed a cupcake with a bunny on top. Crammed the cupcake into her face. When she pulled the cupcake away there was the bunny peep sticking out of her mouth. She is such a cute peep slayer. The other kids loved the peep cupcakes also. What’s not to love? An awesome cupcake with a marshmallow peep on top. Life just doesn’t get any better. The poor peep. He didn’t stand a chance. I hope you try adding peeps to your next cake. Either inside your cake or placed on top as a decoration. 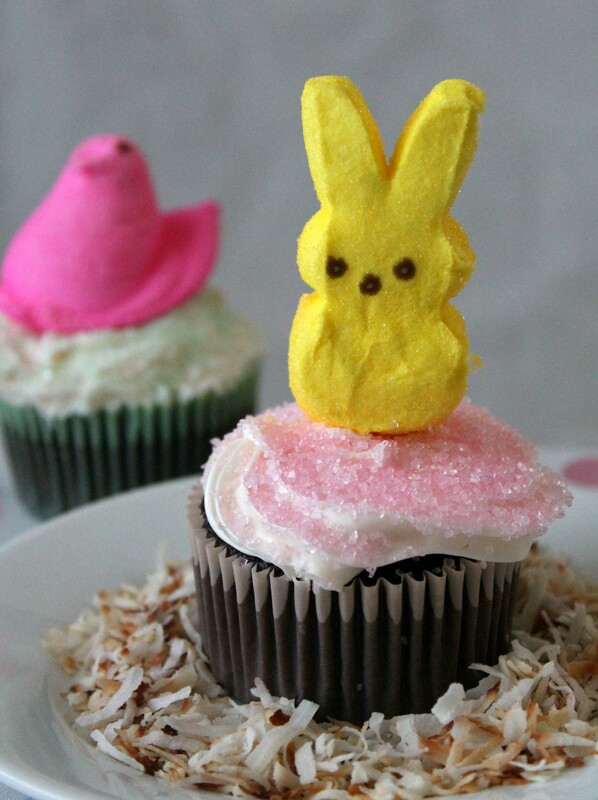 I’m sure you and others will enjoy the amazing peep/cake combo! Thanks for joining me on a Pinteresting peep adventure!